And there’s more. Guess what? We have three more steeper streets than your 22nd and Filbert. We have 28th Street, Baxter and Fargo. Not only that. Eldred Street and those other three are the 3rd, 4th, 5th, and 6th steepest in the country. The whole COUNTRY. Your 22nd and Filbert are 9th and 10th. The Streets of San Francisco don’t look so steep anymore, now, do they? So, San Franciscans, I wanted to check that street out for myself; especially, since, yes, I’m familiar with climbing your streets and stairs. And, yes, I do know which way to turn the tires against the curb depending on whether my car faces up or down. ‘Cause we do that here, too, you know. 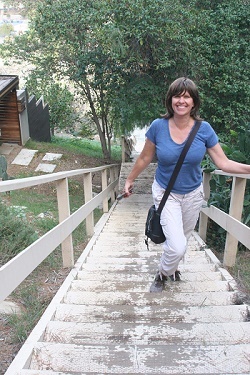 So, I hit up Kelly, who is a good friend and another “I love L.A.” blogger, and we set aside an afternoon to hike up that street. Yes. 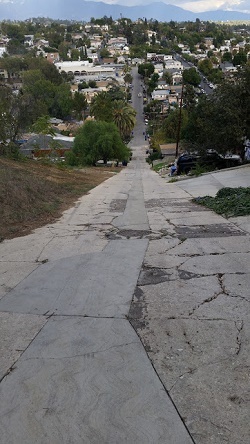 That one – the steepest street in California, San Franciscans. 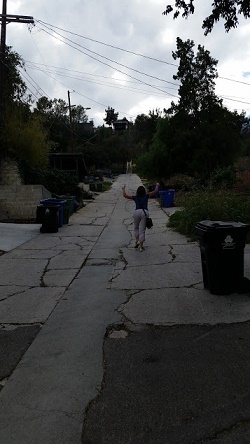 It’s not until I finish my cup of coffee in the morning that I start getting revved up for the hike up that street. It’s been on my list for some time now – just to say I climbed it or, maybe, more obituary material for my relatives to use. To prepare, I’ll need a little nourishment, I think, and a lot of water. So I make a plan with Kelly to meet at El Huarache Azteca in Highland Park for lunch. By the way, San Franciscans, you may say you have the best fine restaurants around, and maybe you do, but I bet no mexican place of yours can beat this place. Not even the price. This place has The Best mexican eats, you know, and from your wallet, you won’t need to pull out more than a ten-dollar bill. So I get on The 101 to The 134 to The 2 then off at York and drive all the way down until I get to Highland Park. It takes only 22 minutes. We eat at the restaurant then land at the base of Eldred Street with our bellies full, 1.7 miles away from the Best Mexican Food around. We don’t have to negotiate curbside wheel-turning, San Franciscans. We get to park flat. Kelly and I stand at the base of the slope and watch it like we’re watching a movie from the front row of a drive-in. After two deep sighs, it’s – Ready. Set. Go. We start the big, long steep climb. As we’re panting, sweating, huffing and puffing, we make it to almost three-quarters of the way up that hill and Kelly gets a brilliant idea. “Walk backwards,” she says. Much better! And before you know it, San Franciscans, we’re up at the top of the street. 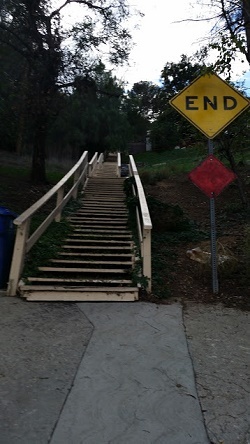 The steepest street in California with no more huffing and puffing. Our sweat has dried. As we get to the end of the road, we see we’re not at the end of the street. We’re just at the end of the road. There are stairs that continue the street, San Franciscans. Just like yours. So, what the heck? We’ve come this far so we climb those stairs, reach the end and look down on the valley below. We did it! I can’t help it. That Rocky movie theme keeps playing in my head over and over and continues to play all the way back down. Next stop, Silver Lake. 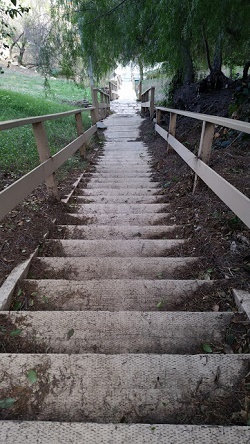 To climb some more stairs. I’m sorry, San Francisco. I do love you. But I love Los Angeles more. Linda, make sure you try that restaurant, too, before you climb that street. The view from the top makes it all worth it! I feel your pain, I live (and garden) on a 45 deg slope. It’s bloomin’ hard work. I love that! I had no idea that SF didn’t rule in the steep street battle. It’s fun reading all the inside scoop from you about LA! Previous Previous post: #MISSINGBASSEL IN THE STREETS OF L.A.